The 1990-1991 East Tennessee State basketball team started the 90-91 season on a high note with a win against BYU in the first round of the 1990 preseason NIT in Provo, Utah. This particular game is notable for several reasons. First, it was the first game that coach Alan LeForce served as a full-time head coach for ETSU and it also ended up being his first win. 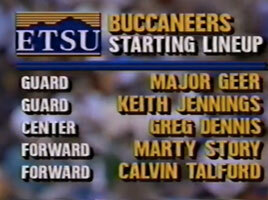 Secondly, it’s also the first game of one of the most memorable seasons in East Tennessee State basketball history, the Bucs would end up winning a school record 28 games in the 90-91 season and was ranked in the top 25 nearly all season long. Lastly, this was actually the first collegiate game for 7’6 BYU center Shawn Bradley, who ended up having an 11 year career in the NBA, playing most notably for Philadelphia and Dallas. Below is the full game between ETSU and BYU. It was a close hard fought game on both sides, with ETSU leading most of the way thanks to great shooting from the 3-point line. Greg Dennis struggled quite a bit in guarding Shawn Bradley but that can be expected when you have to guard someone 7 inches taller than you the whole game. The Bucs would go on to face 5th ranked Arizona in the second round of the NIT, in what turned out to be a preview of ETSU’s 1992 NCAA tournament opponent. See more ETSU basketball games in the video section.